For freedom Christ has set us free; stand firm therefore, and do not submit again to a yoke of slavery. Look: I, Paul, say to you that if you accept circumcision, Christ will be of no advantage to you. I testify again to every man who accepts circumcision that he is obligated to keep the whole law. You are severed from Christ, you who would be justified by the law; you have fallen away from grace. For through the Spirit, by faith, we ourselves eagerly wait for the hope of righteousness. For in Christ Jesus neither circumcision nor uncircumcision counts for anything, but only faith working through love. You were running well. Who hindered you from obeying the truth? This persuasion is not from him who calls you. A little leaven leavens the whole lump. I have confidence in the Lord that you will take no other view, and the one who is troubling you will bear the penalty, whoever he is. But if I, brothers, still preach circumcision, why am I still being persecuted? In that case the offense of the cross has been removed. I wish those who unsettle you would emasculate themselves! To be in Christ is to be free and to be free of Christ is to be a slave. In order to start defining freedom we need to say first what freedom is not. 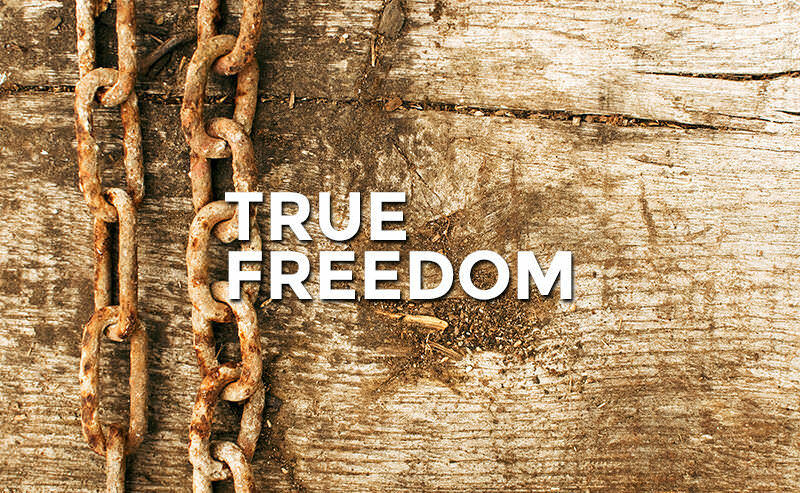 Biblical freedom, true freedom, is not the freedom of choice or the freedom of rules. It’s a deeper freedom. It’s freedom that follows you even into prison. In order to understand true freedom we have to understand the way God made us. There are two specific desires that God placed in our hearts that must be fulfilled. The desire for happiness and the desire for approval. Our desire for happiness is our desire to enjoy life, to be fulfilled; to live in a such a way that brings fulfillment. Our desire for approval is a desire for worth and value. This is where we find our significance. Paul says that to be without Christ is to be in slavery. So how does happiness and approval outside of Christ enslave us? Happiness outside of Christ enslaves us by pursuing things that promise ultimate happiness but never satisfy. Approval enslaves us under the weight of living up to the standards of what we derive approval from. There are two avenues by which we are enslaved but only one avenue by which we are free- Christ. Christ frees us by meeting the standards and lifting the weight of the law thereby giving us access to God, the source of all joy. Freedom then isn’t control over your life, but rather submission to the one that already did the work on your behalf; the one you were created for. The knowledge of our imperfection is not admitting defeat. Acknowledging our sinfulness actually makes us more free. We have complete freedom in regards to approval and partial freedom in regards to sin until Christ returns and completes our salvation. If you don’t realize that even after you put your faith in Christ that you will still struggle with sin, then you will end up putting your hope in your future self instead of Christ. This doesn’t mean that we stop fighting sin; this means that we fight sin with faith through love. You only fight sin to the degree that you rest in what Jesus did on the Cross.